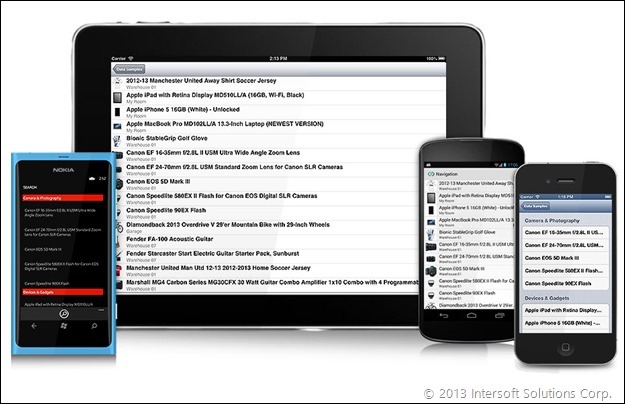 We are pleased to announce the release of our next-gen toolset for cross-platform mobile development: Intersoft Mobile Studio. Shipped with powerful features with small footprint, Intersoft Mobile Studio marks the next industry-standard for cross-platform development. 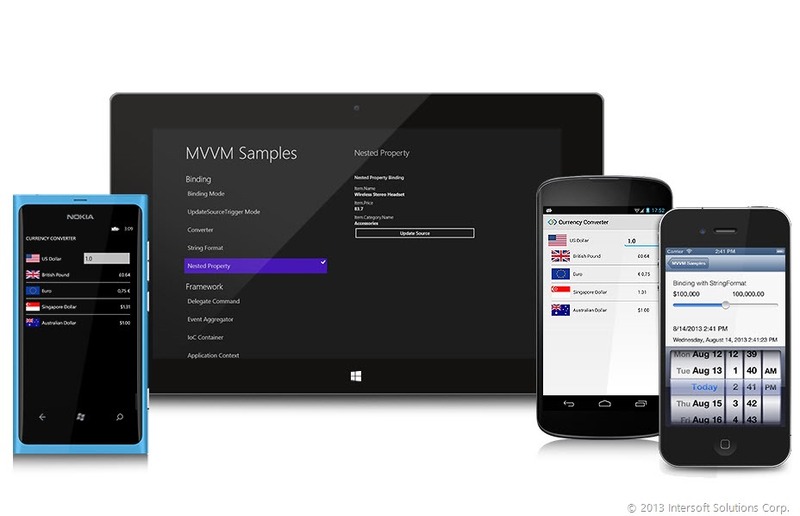 Built with the proven MVVM design pattern on its core, Mobile Studio will definitely change the way you develop cross-platform mobile apps. Designed with the future in mind, meaning that you can easily support new platforms easily as Crosslight is easily extensible to support even hundreds of platforms; you can rest assured knowing that the apps built on top of Crosslight will be future-proof. Remember, you are not developing cross-platform apps that works on in a ported environment; you will create cross-platform native apps that will give your audience a rich and pleasant experience when using your apps. 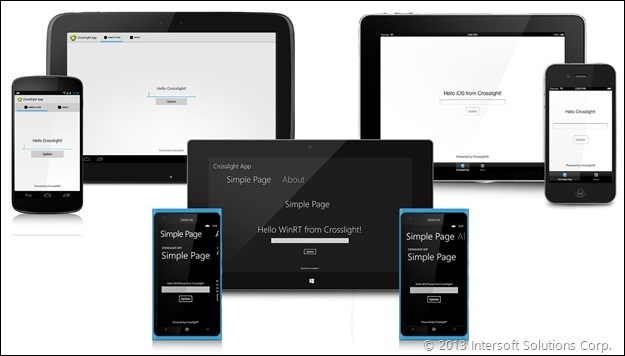 Crosslight ships with a wealth of resources to help you quickly jump start with cross-platform mobile development. 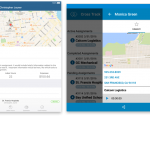 In this blog post, I will provide a quick overview of the available resources and where to start your first mobile development journey. 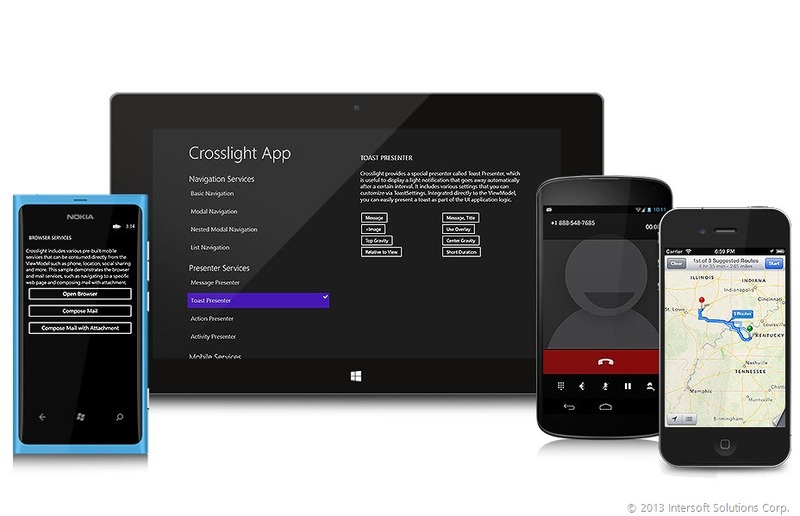 If you haven’t installed Crosslight yet, head to Request Trial page and download the free trial. Once you have installed Intersoft Mobile Studio, open up VS 2012 and create a new project under Visual C# Templates / Intersoft Solutions / Mobile. Click OK, and you will be presented with the Crosslight Project Wizard. 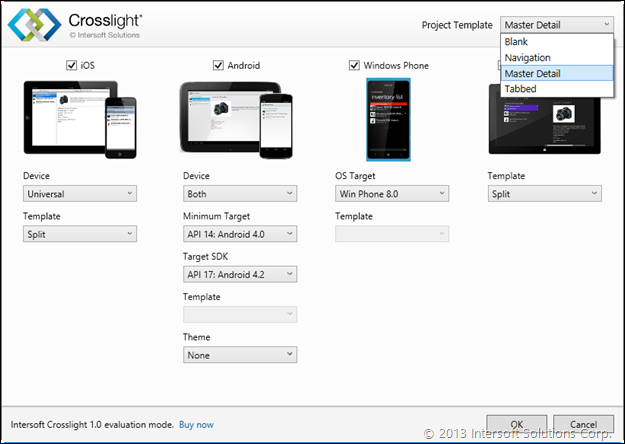 Designed with robustness and flexibility, Intersoft Mobile Studio provides you with four powerful templates that is immediately available for your perusal. 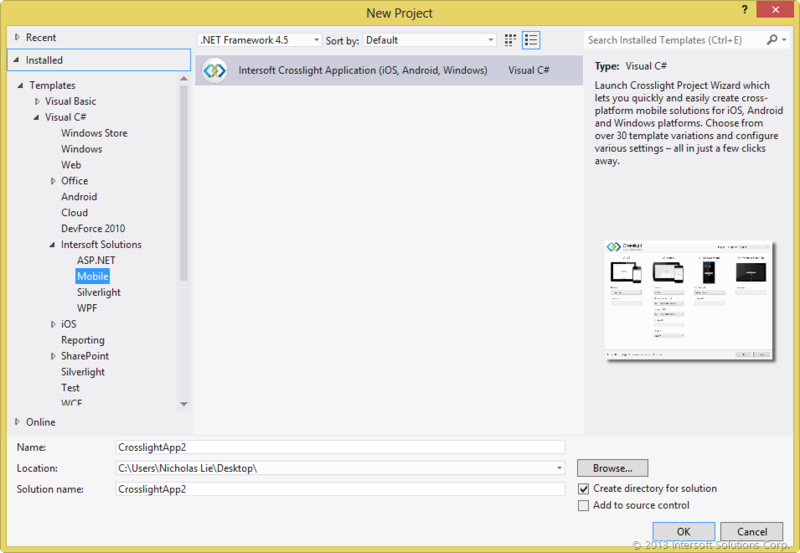 The Blank template is great to help you jump-start development with Crosslight with minimal configuration. It is designed as such for you to quickly grasp the concept of development and design pattern when developing apps using Crosslight. Looking for designing a great-looking app with navigation features? The Navigation template is here to help you. The Navigation template provides you with navigation templates that can be adjusted using either split navigation or list navigation, depending on your choice. This is a truly time-saving template that allows you create master-detail apps easily and quickly. The template deals with the split master-detail view for tablets and is equipped with grouping feature, so you don’t have to scratch your head for a long time on how to build a pleasant master-detail app. 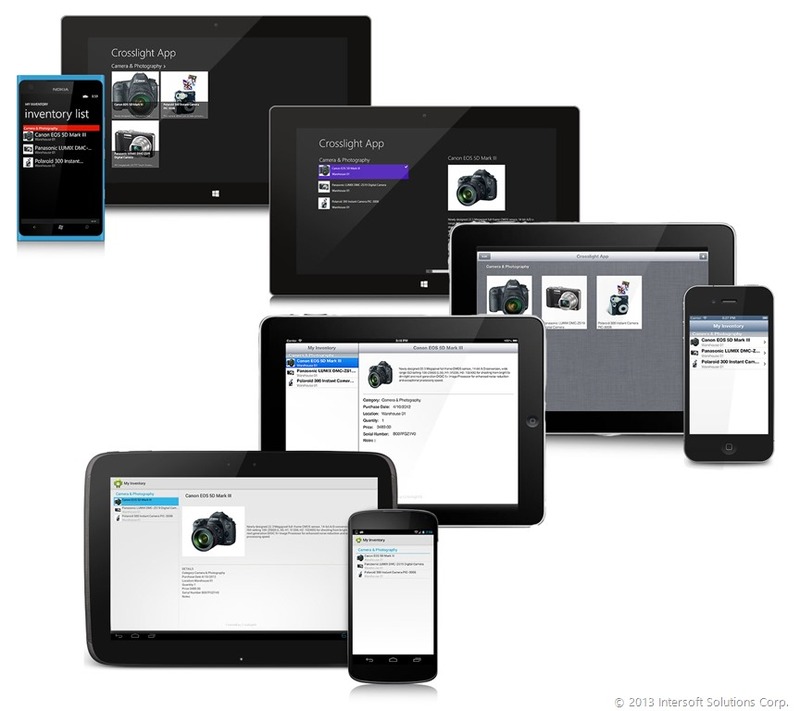 Crosslight supports multi-screen apps in the form of “tabs”, also known as pivot and panorama pages on Windows Phone. Just with a click of a button, you are given apps with tabbed templates that works the consistently that conforms to each platform’s UI guidelines. Did I also mention it is MVVM-enabled as well? After you have finished choosing one of the templates, you will get the following solution structure. Just set as one of the projects as your startup project, and watch the magic happens. If you ever get stuck when developing apps with Crosslight, Intersoft Mobile Studio ships with 300 pages covering the best practices, walkthroughs and concepts for building highly scalable enterprise mobile apps. 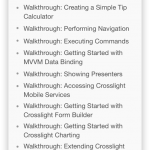 The Crosslight documentation covers a wide range of in-depth topics such as fundamentals of Crosslight, understanding MVVM, defining consistent navigation interface, utilizing the built-in presenters for basic user interactions, working with data, building rich data-entry form, and much more. 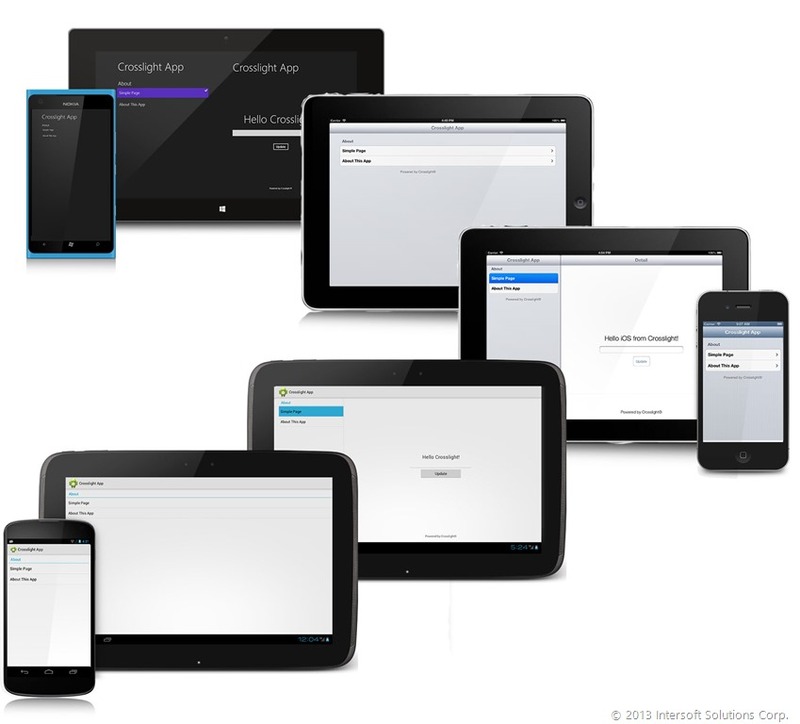 It also covers platform specific topics such as how to define different layouts for iPhone and iPad, using Fragments in Android, understanding navigation patterns in Windows Phone, handling layout changes in WinRT, and much more. To help you get started, Intersoft Mobile Studio ships with four projects that comprises of hundreds of samples across all supported platforms to help you better understand how to develop apps using Crosslight framework. The MVVM Samples is a great place to start as it covers many MVVM features offered in Crosslight, such as demonstrating the basics of MVVM and binding capabilities, for example, binding mode, update source trigger mode, and converter. It also includes several reference samples – such as loan calculator and currency converter – to help you understand how the binding features work together. This project includes a collection of samples showcasing the data-aware features such as presenting as a simple list, grouped list and searchable list. It also shows how to deal with data management in common business scenarios such as data editing, update and delete, as well as batch updating. In addition, it also demonstrates a number of built-in list styles available in each platform as well as showing the customization of list item template. This project includes a collection of samples showcasing various prebuilt services available in Crosslight such as navigation services, presenter services, platform services and mobile services. All services are programmable in the shared application layer which allows you to streamline the user interaction logic as well as enable maximum code sharing. 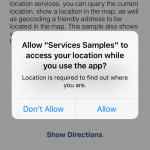 Mobile services demonstrate a vast array of services commonly available to mobile platform such as telephony services, location services, camera services, social services, map services and much more. Thoughtfully designed and well-defined user interfaces, the Inventory Tracker is a a reference sample that works consistently across platforms and conforms to the de facto UI specifications for each platform. The Inventory Tracker provides a lot of meticulous features that offers a pleasant user experience. Features of the Inventory Tracker will covered in depth on the upcoming post. This is just the beginning. With iOS 7 just around the corner, we will be going to fully support iOS 7 within a week after it has been released to the public. 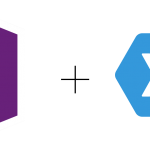 In the upcoming milestone, we will enhance Crosslight with powerful and robust data access framework with sync support, saving you the hassle of writing hundreds lines of codes just for data syncing purposes. Also, we will shift our sprint tasks to a more fast-paced, dynamic progression; giving you regular updates that will tremendously enhance your development experience with Crosslight. Nice write-up! Could you please make the docs (300 pages) available for download? I like to read it before installing the whole system. I’d like to request if you can cover data transaction between mobile and server and also, how data can be stored/retrieved from local storage. BTW, since you cover 4 platforms, how are you dealing with local storage? With regards to your cross-platform questions: Crosslight doesn’t attempt to unify the platform API so we never have problems with capabilities in each platform. Instead, Crosslight creates a platform-neutral bridge that connects one dot to another in a single line, and so long until it perfectly connects all the dots. Now change those dots into platforms. Simply said, Crosslight leverages advanced architecture — what we called as Smart Delegation — combined with MVVM pattern to produce maximum loosely-coupled design. So yes, you can call something like this.StorageService.Save(data) in your ViewModel. You don’t need to worry how each platform works because Crosslight is smart enough to understand how to dispatch that message in each platform’s respective API. That’s what Crosslight has to offer. Just write minimal code and build easily. We’ve spent countless hours for the platform automation, so you don’t have to. And that’s Crosslight. Ben, you should really take a look at our samples. We shipped with dozens of mobile services — activating camera to capture a photo, locating an address via GPS, calling a contact, and more — all with a single line of code. Go ahead, give it a spin..